KampRite Original Size Tent Cot. For many people going camping is one of the most liberating feelings in the world as it allows them to get away from the hustle and bustle of the city and spend some quiet time communing with nature. While sleeping under the stars was cool when you were a kid, as you get older you expect certain creature comforts. First, it is a tent, something portable, easy to assembly, and big enough so you don’t have to go outside to change your mind. Ok, that is pretty simple and there are thousands of tents on the market today. However, sleeping on the ground can be an issue, especially if you have a bad back. Don’t get me wrong, going to sleep to the sounds of crickets chirping is great. Yet how many campsites are on level ground, and I am sure anyone who has gone camping has had the experience of trying to sleep while a rock is nudging them in the back. If falling asleep isn’t hard enough, think about waking up in the morning, your back sore from a night’s sleep on the cold, hard ground. Too many nights like that can ruin your trip as you can’t get enough rest and you end up spending your days feeling tired and restless. So let’s take a deeper look at three of the best-selling tent cots on the market today. After all, why carry a tent and a cot when you can just carry one bag that does it all. The name is a mouthful, but this tent cot is built for two. One of the best-selling off the ground products from KampRite, the Double Tent Cut offers 3 benefits rolled into one. First, it is easy to set up. Second, it gets you off the cold hard ground. Third, the tent helps to protect you from the elements. Build like a full-sized tent, the KampRite Double Tent Cot has two mesh entry doors at either end. This allows easy access as well as a bit of cross-ventilation. This tent bed also comes with a rain fly for added protection from the elements and a roller wheel, carry bag. Every color you want as long as it is green. Even though this cot has been discontinued by the manufacturer, you can still request warranty information through Amazon, or wherever you shop. Combining the utility of a tent and a cot, the KampRite Oversize Tent Cot, helps to keep you off the ground while protecting you from the elements. Another best-selling off the ground option from KampRite, the Oversize Tent Cot offers 3 benefits rolled into one. First, it is easy to set up. Second, it gets you off the cold hard ground. Third, the tent helps to protect you from the elements. Just like a tent, the KampRite Oversize Tent Cot has two mesh entry doors at either end, which allow for easy access as well as a bit of cross-ventilation. This tent bed also comes with a rain fly for added protection from the elements and a roller wheel, carry bag. The tent and the bed are 90” long, so it is a great option for someone who is taller. 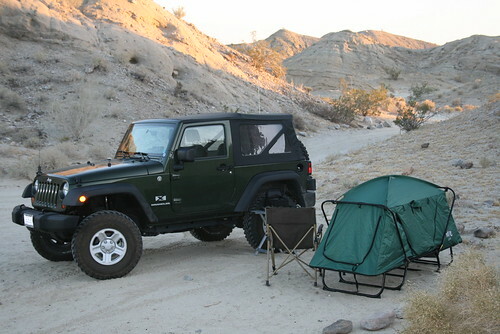 This is the one that started it all, the original tent cot from KampRite is the preferred choice of the U.S. Military. This tent bed is big enough for most people. In fact, there is enough room that you can even get dressed inside – providing you don’t stand up. When folded the KampRite Original Size Tent Cot is 32” x 30” x 6” and only weighs only 18 lbs., making it easy to carry. The windows and doors have ‘No-See-Um’ mesh screen, this way you can let in the breeze, but keep out the bug. This tent bed also comes with a rain fly for added protection from the elements and a roller wheel, carry bag. Let’s face it, someone needs to carry this tent cot from the car to the campsite. Even if that it just a 100 yards, you want a bed that does not require an entire scout troop to lift. Of the three cots we reviewed the KampRite Original Size Tent Cot is the lightest, weighing in at 18 lbs. Even though it is light, this cot can hold up to 300 lbs., so you can see why it is the choice of the U.S. Military. However, the KampRite Original Size Tent Cot is slightly smaller than the KampRite Oversize Tent Cot, so if you are a bit taller you might want to trade up. The KampRite Double Tent Cot was never going to win this review, and it is not designed to. At 44 lbs. 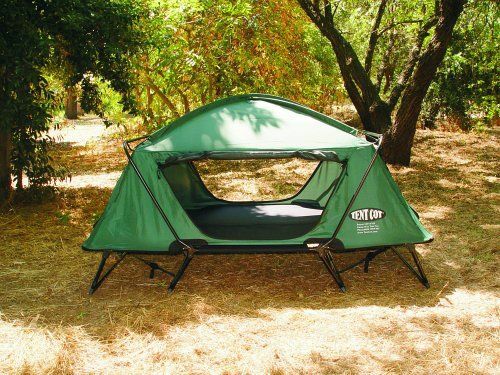 this tent cot is by far the heaviest of the three we reviewed, however, if you factor in this tent bed can accommodate two people then maybe it is not such a bad deal after all. So we tried to destroy these tent cots. Abusing the frame, ripping the fabric, doing everything we could to ruin them. While none of these choices are a brick bunker, the KampRite Original Size Tent Cot comes close. You can see why it is the choice of the U.S. Military. Despite it being lightweight, it is resilient. The KampRite Oversize Tent Cot comes close, but we felt the Original Tent bed was slightly more durable. Unfortunately, the manufacturer has discontinued this camping bed, so if you really need a warranty you need to check with the seller. According to Amazon’s website a manufacturer’s warranty can be requested, but you should check the terms first. You are just visiting, so you don’t want to spend a fortune on something you won’t use every day. KampRite Original Size Tent Cot comes out on top here. But this comes with a caveat. If you intend to go camping with someone special, then the KampRite Double Tent Cot would actually be the better choice. In the end, it comes down to how you prefer to camp – alone or with someone else. So we have looked at portability, durability, the warranties, and value. However, deciding which tent bed is best really depends on how you plan to use it. I am not 6’ 7”, so for me the best choice is the KampRite Original Size Tent Cot, it is a high-quality tent bed at a great price and can handle just about anything I would plan to through at it. For me, the winner is the KampRite Original Size Tent Cot, not only is it comfortable, but it is also built for adults. This is not to say the KampRite Double Tent Cot or the KampRite Oversize Tent Cot are not good products, they just weren’t right for me. Whilst my preference is the KampRite Original Size Tent Cot, you should get the tent bed that is right for you. If you are a bit taller, then the KampRite Oversize Tent Cot will be right for you. And you can’t go wrong with the KampRite Double Tent Cot if you usually go camping with someone special. As you conduct your due diligence, make sure to check customer reviews on Amazon and other websites. All three of the camping bed are highly rated and have great reputations, but the key is to look for other customers who will use the cot the same way you will. All three tent cots are, portable, durable, comfortable, and will help you get off the cold, hard ground. In the end, the choice is yours, do you need a tent cot for two people then go for the KampRite Double Size Tent Cot. Or are you an adult seeking a good quality cot for yourself, the go for the KampRite Original Size Tent Cot. You can’t go wrong with any of these tent cot beds, just take a step back and review what you need before you buy. In the end, the most important thing is getting a good night’s sleep. Choose best Camping Tent Cot Beds for yourself !!! Thanks for your review. What are the dimensions of the carry bag for the oversize Kamp Rite tent? Do you think it’s worth it to purchase the storage bag that attaches underneath the frame? To Whom it may concern regarding these reviews. I am the CMO of Kamp-Rite, this information regarding the manufacturer discontinuing the line of Tent Cots is purely false. We are the original manufacturers and inventors of this product. Please contact me and please change these statements in your review. 800 709 9905.